During the devastating conflict in Syria where half of the country’s pre-war population has either been injured, killed or displaced, over 20 000 refugees found shelter in Armenia, some of which left soon after they arrived seeing no future in the country. But the majority stayed, and while most of them have ended up in Yerevan, some newcomers have settled outside Yerevan, the capital of Armenia. We spoke with some of the newcomers who fled the civil war in their home country to make a new life in Armenia, but unlike the majority, these newcomers become successful entrepreneurs outside Yerevan. 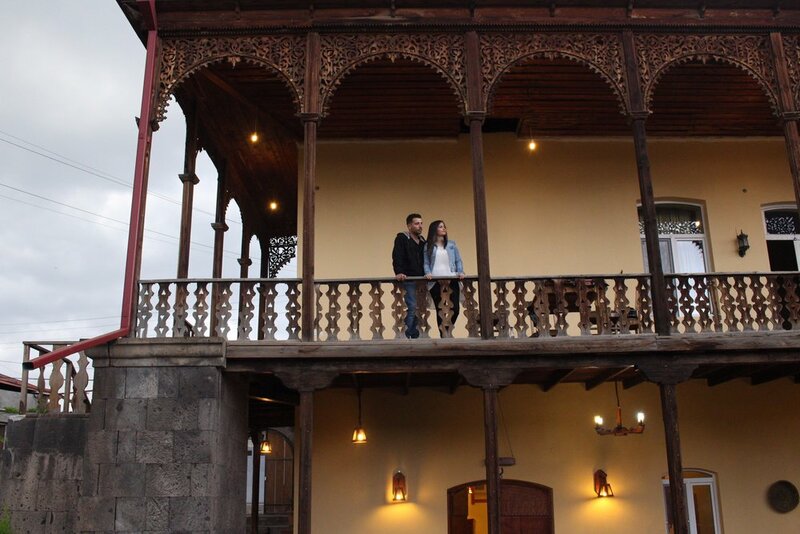 Talar Zakarian(from Kamisli, Syria) and Hovik Aroyan(from Tartous, Syria) in their home in Ashtarak. Talar (24) came to Armenia from Kamisli in October 2012 and settled in Proshyan village near the capital as the conflict in Syria escalated and it was no longer safe to go back. In 2016 she met her fiance Hovik(25) from Tartous, Syria, they fell in love and got engaged shortly after. Hovik’s parents met and got married during their studies in Armenia and Hovik was born in Yerevan. They moved back to Syria after graduation. Hovik was 13 when they immigrated to Canada where they lived for 10 years before repatriating to Armenia in 2015. In Armenia the Aroyans fell in love with Ashtarak from the first sight and decided to settle there. The second floor of the house where the family run restaurant is located is also their home. It is a old building from the 19th century full of history. The house used to belong to a well-known priest, then it became a makeshift hospital during the second World War, a winery and eventually a military hub during the post-soviet years and was abandoned for 20 years before the Aroyans purchased it. Talar and Hovik plan to get married soon. They intend to live and work in Ashtarak as that is where the family business, "Old Ashtarak" restaurant is located. Hovik also plans to continue his studies in the AUA and lead his family business simultaneously. Hovik: No, I prefer to stay here, in Armenia. Both in Syria and Canada I felt like a stranger but here in Armenia I felt I am home immediately: everyone speaks Armenian, everyone is Armenian. From my childhood I always had Armenia on my mind and wanted to repatriate. Hovik Aroyan with his pet dog Sujukh. He found the puppy on a rainy day and took him home back in 2015, and they are best friends ever since. Hovik: My friends, my memories in the streets of Tartous...most of whom are now scattered around the world, so it will never be the same even if I go back. I was back a year ago and it was all different. What do you like most about Ashtarak? Talar: The simplicity of people, the architecture, the security, we are free to go out at any time, there is no danger here. Hovik Aroyan’s parents in the kitchen of their restaurant. Sevan Haboyan and Habib Aroyan. While Sevan is the chef, Habib takes care of the logistics and bbqs. What are the most favourite dishes at “Old Ashtarak” for the locals? Sevan: Toshka and fattouch seem to be the favourites. They start getting used to our kebab too. The local kebab is served with diced onions and parsley, and it is “swollen”(thick) because of some ingredients they add here, and locals used to complain that our kebab is too “thin”. We used to tell our customers, our kebab is made of pure meat that is why it is not so thick. Now customers start to get used to it. Another specialty we serve here is kebab with aubergines, and locals are not used to it at all. Which ingredients was hard for you to find here? Sevan: Shanklish is a kind of cheese that we can not find here, so we started making our own, it’s used in salads mostly. I called my friends in Syria, got the receipt and started making my own. Same with zaatar. Here I also learnt to cook the local specialties like stolichny salad, khashlama, I never knew about avelouk salad, but some customers asked for it and now we make it too and they like it a lot. I make everything fresh and do not prepare anything in advance. When did you come to Armenia? Sevan: Me and my husband got our PHd degrees here in Armenia and I gave birth to my son Hovik in 1991 here, then we went back to Syria in the hope to continue our studies but then the times were hard here and we immigrated to Canada. The good thing is that now we are back in Armenia and our repatriation has been very purposeful: my son Hovik met his love, Talar here and they got engaged. Now we are here to stay. What do you like most in Armenia? Sevan: I like that here in Armenia we are all Armenian and nobody can tell me I do not belong here or that I should go back to my country. And even if a war starts in Armenia I won’t think of leaving this place because it’s our home now. I do not want to be a second class citizen, I am an Armenian and nobody can send me away from here. Here in Armenia we do not have the issue of preserving our Armenian identity, our language. If we stayed in Canada, my children would have forgotten Armenian, here we do not have to worry about that. And here my grandchildren will attend Armenian school and speak Armenian. What do you miss most in Syria? Sevan: I miss the warmth, the abundance of the peaceful years in Syria. We were wealthy there, the majority of Armenians were middle class or even higher, here’s it’s more difficult. But it’s difficult everywhere wherever you go. There is poverty in Armenia, I would like local people to be able to afford coming to our restaurant even for a cup of coffee. If the community is doing well, our business will be doing well too. Now we reply a lot on tourists, which is seasonal. Locals know us and encourage us, people tell each other about us and our restaurant and they come visit us a lot. The ARP was one of the few organizations that has attempted to pilot the integration of Syrian refugees in regions of Armenia outside the capital city of Yerevan where life was more affordable and entrepreneurship opportunities more abundant. We have consistently advocated for a comprehensive country integration plan from the Government of Armenia (see here). We are thrilled to see so many Syrian refugees find Armenia to be safe enough to call it "home" and start new lives again(see Economist June 26 2017 post here). Armenia, the young state of an old nation, seems to continue attracting both tourists and refugees. Classic Soviet ARMENIA Intourist vintage poster by Sergey Igumnov, is believed to have been commissioned in 1936. Intourist rightfully understood that the prevailing European artistic trend of Art Deco design would be more appealing to potential tourists than Social Realism. "The image of Soviet Armenia communicated here is a glamorous and varied one. The train and the car in the foreground boast the advanced modern machinery of the period, and the high railway bridge is an example of Soviet engineering skills. The beauty of the country's natural landscape is shown in the background. The poster creates an image of glamorous tourism, and is similar to travel posters produced in western Europe at the time" (Victoria & Albert Museum, vam.ac.uk). This is the English version. Intourist pl. 29 (var), Tourism p. 113, Crouse p. 303 (var), Affiches Art Deco p. 111.